The New Ford KA+ and for the first time also offered as New KA+ active crossover version – delivers greater comfort and convenience, more driver assistance technologies, and enhanced interior and exterior styling. For the first time a choice of petrol and diesel powertrains is offered, including Ford’s new refined and fuel-efficient 1.2-litre, three-cylinder petrol engine offering 70 PS or 85 PS, and Ford’s 95 PS 1.5-litre TDCi diesel engine designed to meet the needs of higher-mileage drivers. The New KA+ helps to keep your trips to the petrol station at a minimum. For a start, the new and nippy 1.2-litre petrol engine is built to improve efficiency, whilst also delivering rewarding performance of either 70 PS or 85 PS. And, new to New KA+, Auto Start-Stop automatically switches off your engine when waiting in traffic or at a red light, seamlessly restarting when you’re ready to pull away. 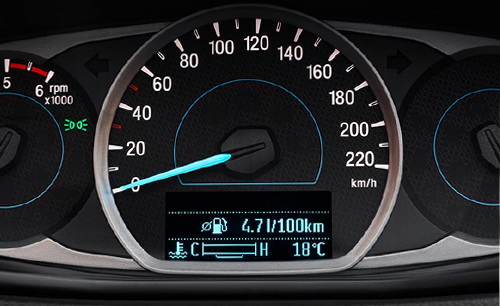 In fact, efficiency is built in: low rolling resistance tyres, aerodynamic design, low-friction engine oil… every little detail is designed to reduce fuel consumption.. The New KA+ might be compact, but there’s still space for five adults. And it’s available with an impressive range of smart technologies, all there to make life easier. Handy keyless entry is just one example. You’ll enjoy advanced SYNC 3, too. This advanced system helps you to stay connected by enabling you to control your phone and music with intuitive voice commands. The system also connects to Apple CarPlay and Android Auto. Plus, with Applink, you can access some of your favourite smartphone apps. 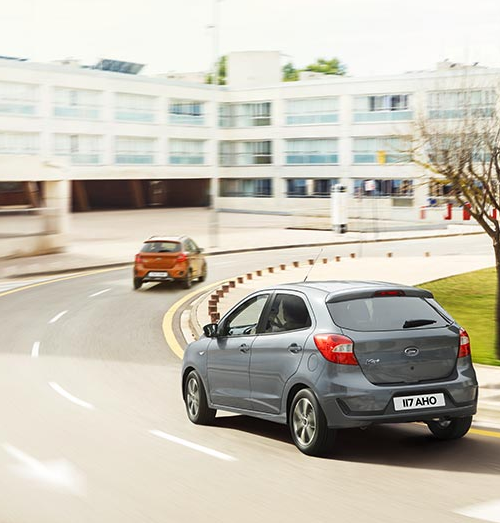 Available in Essential and Ultimate specifications, in addition to the new Active model, the new KA+ features a high-mounted trapezoidal grille and large, swept-back headlamps, in keeping with Ford’s latest design language. A new mesh grille features a chrome surround, and standard foglamps and daylight running lamps are highlighted with a distinctive C-shaped chrome detail, echoed by a C-shaped moulding at each corner of the rear bumper. Restyled front and rear bumpers contribute to the assertive new look. New available comfort, convenience and driver assistance technologies will help deliver a more relaxed, refined and confident driving experience for new KA+ and KA+ Active customers. 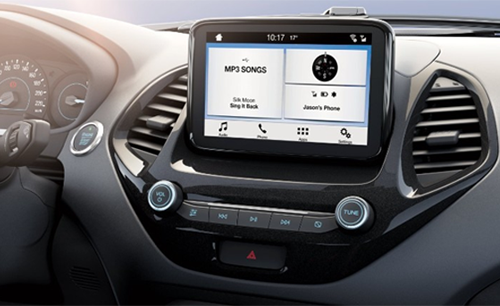 Ford’s SYNC 3 communications and entertainment system enables drivers to control audio and connected smartphones using voice commands, or via the tablet-inspired 6.5-inch colour touchscreen, and is compatible with Apple CarPlay and Android Auto™. 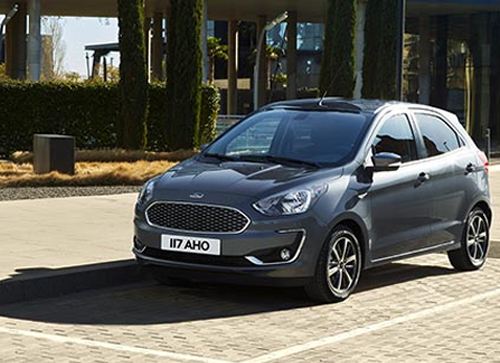 All KA+ and KA+ Active models offer a comprehensive standard specification including power front windows and door mirrors, remote central locking, Hill Start Assist, Speed Limiter, and Ford Easy Fuel. 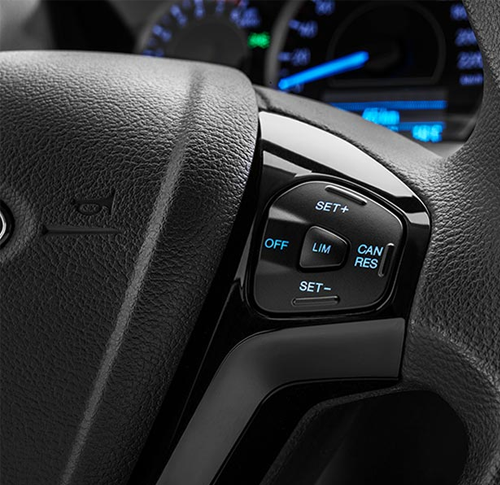 The engine now starts with the push of a button, and in response to customer feedback, the bootspace is easier to access with a tailgate-mounted switch for easy opening, in addition to the convenient interior release accessible from the driver’s seat. The new KA+ and KA+ Active for the first time offer customers the power of choice, with available fuel-efficient petrol and diesel engines that meet the latest, stringent Euro Stage 6 emissions standards, supported by standard Auto Start-Stop technology. Both KA+ and KA+ Active are offered with Ford’s 95 PS 1.5-litre TDCi diesel engine –anticipated to deliver from 99 g/km CO2, producing 215 Nm of torque at 1750-2500 rpm for effortless cruising over longer distances. The 1.5-litre TDCi features optimised combustion chamber design, turbocharging and sophisticated fuel injection to enhance refinement. Smart Regenerative Charging improves fuel‑efficiency by selectively engaging the alternator and charging the battery when the vehicle is coasting and braking.